So, how to go about finding the best eDiscovery talent for your project? Luckily, we have laid it out for you! It starts with identifying the ideal skills for the project. Be picky! Start by considering the years of experience preferred for the project. For example, first pass review ideally requires one to two years of experience, while those conducting second pass and privilege review typically have three to five. Will your ideal candidate have more experience with, say, privilege review? Will he or she be well-versed in a platform like Relativity or Concordance? It’s also important to consider the types of litigation a candidate has handled and their industry experience. Should this person be bilingual, or have some level of proficiency in a foreign language? Platforms like LexInsight help you find attorneys with these skills. While posting your project, LexInsight allows you to specify the skills and experience that are necessary for the project. This allows attorneys with the relevant skills to search for and bid on your projects. Currently, LexInsight has over 2,000 US-licensed attorneys registered on the platform. Get searching! You can be proactive in your hunt for the right attorneys. 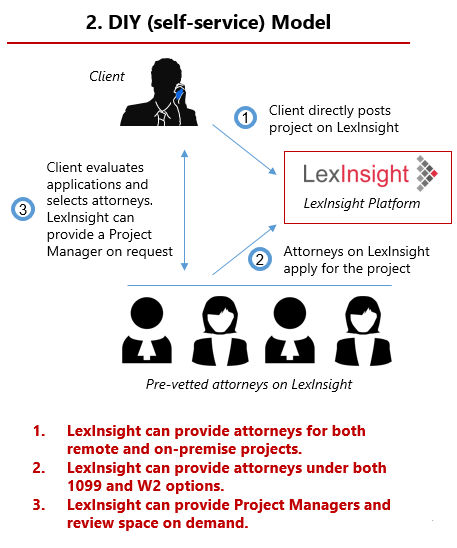 When you post your project on LexInsight, you’ll start receiving bids from qualified attorneys within minutes. However, LexInsight’s marketplace modelprovides you with a way to be even more proactive in finding the best attorney for your project. A big benefit of the marketplace model is powerful, advanced search functionality. When attorneys sign up for LexInsight, they upload a resume and provide details about their background and experience. You can use LexInsight’s search capabilities to find the best attorney profiles for your project needs. Best yet, it enables you to invite an attorney to your project directly from his or her profile, even if they have not directly bid on your project. Don’t want to spend the time searching for doc review attorneys? Okay, that makes sense, too. Managed Staffing Model: We take care of everything, nothing changes from the client’s perspective. DIY/Self-Service Model: For small firms and solo practitioners. You do everything yourself, while we are there to help if needed. LexInsight benefits in a nutshell. No cost upfront. There is no charge for posting projects or evaluating attorneys. You pay only when you hire. Lower overall cost. The cost of using LexInsight for hiring your next document reviewer is 30% — 60% lower than a traditional staffing agency. High responsiveness. Within minutes of posting a project, you’ll begin receiving bids from qualified professionals. Large talent pool. 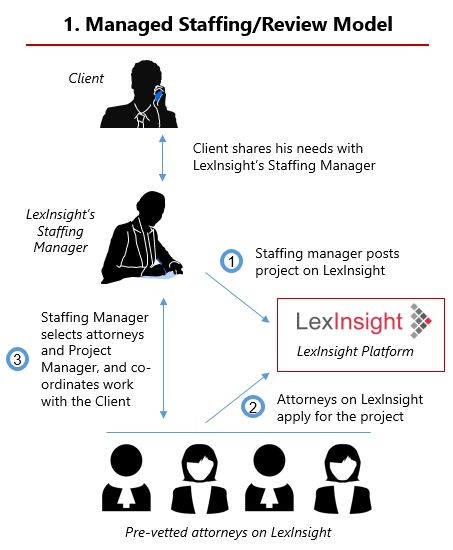 With LexInsight, your project can be viewed by a talent pool of over 10,000 US-licensed attorneys. Powerful search. Find attorneys as per your specific requirements easily. Why does it work? Because LexInsight is founded by legal industry veterans. LexInsight was created by LexInnova Technologies, a well-established name in the patent and IP consulting industry. Founders of LexInsight are veterans of the legal industry, and have been quoted by the likes of Forbes and the Wall Street Journal. LexInsight was created based on the numerous conversations we had with our clients and attorneys, highlighting the need for change in the eDiscovery staffing model (check our our founding story). We are working hard to simplify eDiscovery hiring through the use of latest technology, while maintaining the same level of old-school service that you are used to. If you’d like to learn more about the marketplace model for hiring, finding the best eDiscovery talent, and lowering overhead costs for your firm, contact us at team@lexinsight.ai today! We offer demos, best practices, and more, and we’d love to talk about what LexInsight can do for you.